The Greek police arrests 15 people, belonging to a large network trafficking drugs from Albania to Greece and other European countries. According to the Greek police, the network is financed and directed by Klement Balili. The Greeks are unable to arrest Balili, whom they call “the drugs baron of the Balkans,” but a national arrest warrant is issued. The Greek media publish the first reports about the dismantled criminal network. They confirm that the head of the organization, Balili, now baptizing him the “Escobar of the Balkans,” has not been arrested. They claim that Balili is the director of transport in the Albanian city of Saranda, and has close ties with high officials. The Albanian embassy in Athens writes to CNN Greece denying that any Albanian official has said that Klement Balili has links to Albanian politicians. The opposition publicly accuses Minister of Interior Affairs Saimir Tahiri and high-level public officials of protecting Balili. 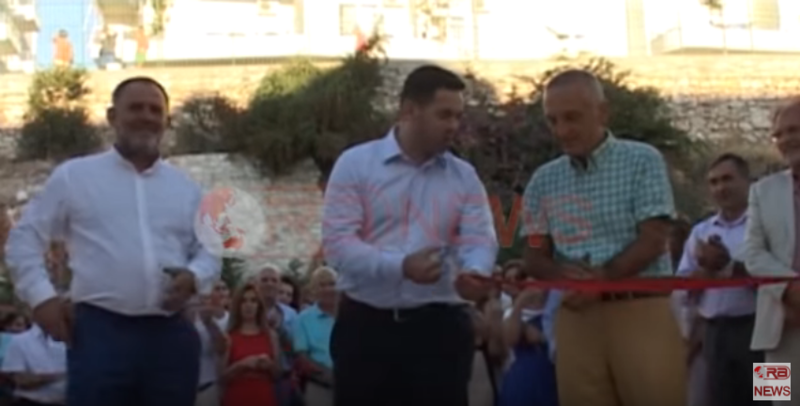 Media publish a video in which Speaker of Parliament Ilir Meta, Minister of Finance Arben Ahmetaj, and former Socialist Party Deputy Koço Kokëdhima cut the ribbon at the opening of the Balili’s luxury hotel in Saranda, Santa Quaranta. The police declares that the Greek side has made no official request for the arrest of Klement Balili. The General Prosecution send a request for juridical assistance to the Greek Ministry of Justice through the Albanian Ministry of Justice. Klement Balili is dismissed as Director of Transport in Saranda. The Police of Saranda receives the order to arrest Balili, but cannot find him. The Greek authorities issue an international arrest warrant for Klement Balili. Interpol Tirana informs the Ministry of Justice and General Prosecutor about the warrant. The Albanian Ministry of Justice relays the request for juridical assistance from the General Prosecutor to the Greek Ministry of Justice, two weeks after the request was made. The Democratic Party publishes a photo in which Klement Balili is cruising on his yacht along the coast of Saranda, accompanied by a high official of the police, claiming that the photo was taken after the issuing of the international arrest warrant. National and Greek media publish a video in which it is claimed that Balili is partying in the companionship of the head of the PS in Tepelena, on the wedding of the nephew of his wife, who has replaced Balili as Director of Transport in Saranda. Klement Balili speaks out in the Greek newspaper Ethnos, claiming that the accusations toward him are political and aim to damage Prime Minister Edi Rama. Balili denies his luxurious lifestyle, in spite of the fact that he owns a luxury hotel and a large apartment complex. He states that as Director of Transport in Saranda he had to wake up at 6 o’clock in the morning and worked until 8 in the evening for a small salary. The Greek Ministry of Justice sends the complete 10,000-page dossier to Albania, with all the proof on Klement Balili’s involvement in drug traffic. The translated dossier is transferred from the Ministry of Justice to the General Prosecution. CIA Director John Brennan unexpectedly visits Tirana. Sources close to the government confirm that one of the reasons of the visit is to pressure the Albanian government to cooperate with international operations against drug trafficking. The Albanian police organizes a large police action in the south of the country to capture Balili, without any result. This is the first action taken by the police since May. The brother of Klement Balili state in the Albanian media that Balili has been Saranda the entire time and that there has never been an arrest warrant from the police. He claims that while the police invaded Saranda to arrest him, Balili had been in Tirana on business. US Ambassador Donald Lu severely criticizes the police, the Ministry of Interior Affairs, and the prosecution for their failure to capture Balili.